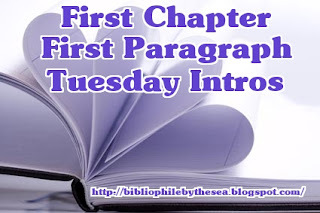 This is like a meme within a meme, because I'm taking part in Diane's First Chapter First Paragraph, but my emphasis this month is on France with the Paris in July meme sponsored byThyme for Tea and Bookbath. One more French book. 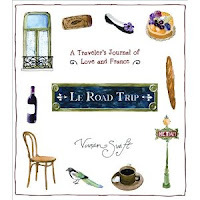 This one, by Vivian Swift, is Le Road Trip. She calls it "part journal," "part instruction manual" for a traveling lifestyle in France. It's kind of hard to pinpoint the first paragraph here because the book is set up kin of newspaper style with different columns. I'm going with this paragraph because it seems to start the story. When I was 19 years old I worked in the office of a factory that made industrial gauges. All day long I filled out shipping forms, by hand, in pencil, which I then handed over to a skilled worker -- the typist. I understood, from the names on theses shipping forms, that gauges were used to manufacture a variet of liquid and gassy things, from beer to chemical weapons. Gauges. They are a dreary way to view the wonders and evils of human enterprise. It was my first day back at work after the New Year holidays of 1975. I stared at a stack of shipping forms and suddenly knew that I had to quit this life. I had to go to Paris. Open to a random page of your current read and share a teaser sentence from somewhere on that page. 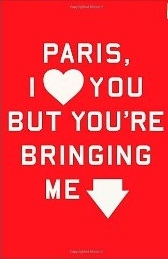 Three Truths: One: You are not Parisian and you never will be. Don't let that bother you. Two: Parisians don't want to know you, no matter how well you dress, so you might as well be yourself. Three: Deep down, Parisians are crazy jealous that they can't let loose like us crazy Americans. I've loved participating in Paris in July and getting to learn about great new books set in France and experiences that people have had. I hope that next summer, I'll be able to use a first paragraph from my own book The Summer of France as a First Paragraph and Tuesday Teaser meme. Until then, Bon Voyage. The whole family went to see The Three Musketeers yesterday since it was the final performance. Tucker brought along his girlfriend and Spencer barely fit into the seat, his knees jamming against the wooden seat in front of him. But neither of them were prepared for how uncomfortable the play was going to make them. Here's Grace's first scene. As you can see, it was a bare-bones set. From the very first scene, when D'Artagnan tells Grace's character that she's the most beautiful thing he's ever seen, the boys were squirming in their seats. The next seen, D'Artagnan kisses her. From then on, they tensed in dread whenever D'Artagnan was on the stage with Grace. "Oh no," Spencer mumbled under his breath. I may have even captured it on some of the scenes I filmed. At the intermission, I let them leave, even though they didn't get to see Grace's character kill Catherine de Winter. Yeah, the story totally changed in this one, but it added a lot of comic elements. Here's a shot of Grace with some friends after the play was finished. Now, let the summer begin. 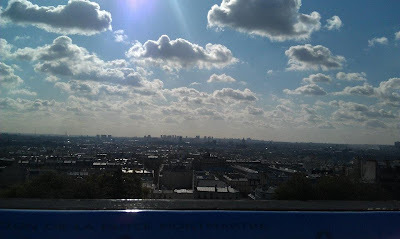 This month, I'm also participating in Paris in July sponsored byThyme for Tea and Bookbath, so, of course, I need a France related photo, and I can't believe we're at the end of July so this is my last official France post. When people ask about my obsession with France, I say I've visited a number of times. I finally sat down and counted. I've been to France nine times. So, I decided to post a photo from each visit. My first trip was in 1983 between my junior and senior year of college. I went with my boyfriend on a student tour of a gazillion countries. I packed a gigantic suitcase. 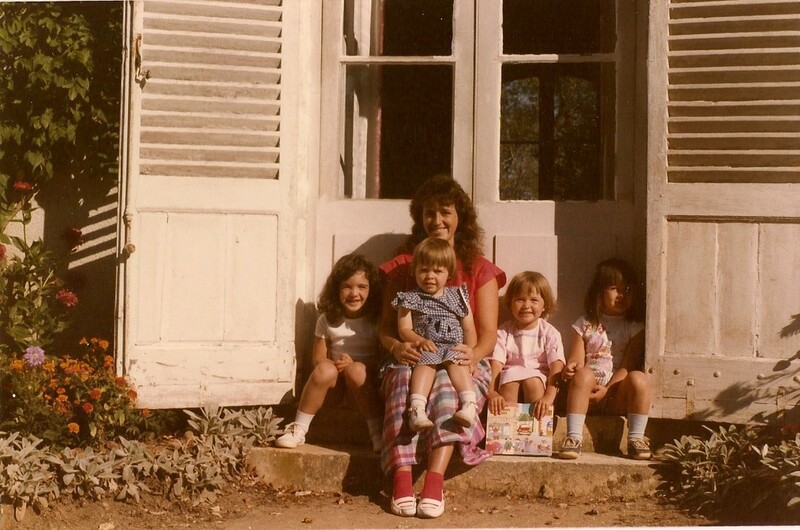 Next, I went to France in 1985 for three months as a nanny to two American girls who had French grandparents. 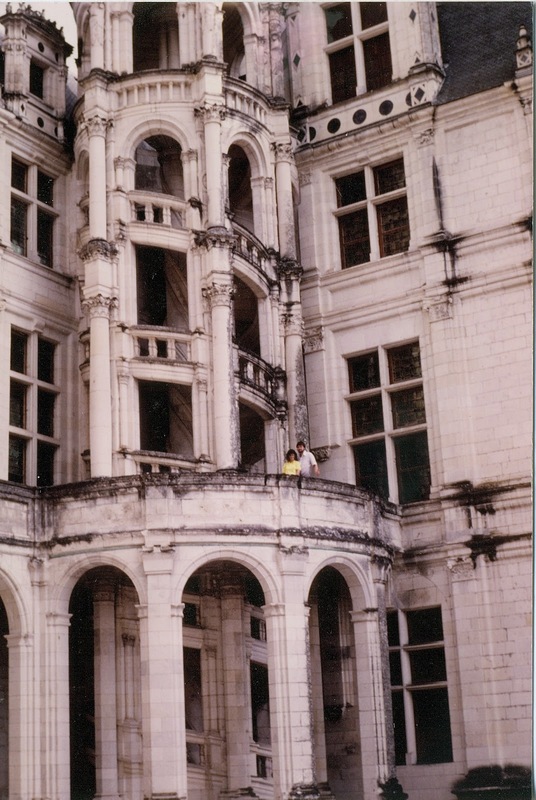 We stayed in Corsica, near Bourges, and in Paris. This was at their country house outside of Bourges. My next trip was with my husband in 1991, the year after we got married. We came home from the trip pregnant with Grace. Our next trip was with all three kids, ages 2, 4 and 6, in 1998. French friend Marguerite lives in Paris. She taught English literature in school. I went to Paris with my friend Michelle in 1999 after her mother, who was from France, died. Michelle had never visited France. Earl and I went for our favorite trip in 2002 maybe. We're unsure of the exact year. That's our estimate. This is us in front of the Pont du Gard. We actually rode our bikes across it. We went again the following year for a 5-day weekend in Aix en Provence as I did some research for a book. In 2006, we took all three kids again, age 14, 12 and 10. In 2010, Earl and I went to celebrate our 20th anniversary. Could there be another trip in 2012? How about 2013? Somehow, Grace manages to find theater wherever she goes. Last summer she was in a community production of Pride and Prejudice, the musical. Those same people who adapted Pride and Prejudice wrote music and adapted The Three Musketeers this year, and they told Grace they'd written a part specifically for her. She felt flattered, but worried that she might be reaching above her abilities. "I've never been the leading love interest," she wailed one night after a frustrating rehearsal. She plays Constance, who in this version, is the love of D'Artagnan and who is unfortunately married to D'Artagnan's landlord. The D'Artagnan actor is a dashing blond who just graduated from high school and strides across the stage singing his love for Constance. The landlord, Constance's husband, luckily is supposed to be a "silly man" because Grace's friend Leron plays him. He's a 6-foot, 4-inch, gay, African American man and he camps it up. He might just steal the show. Grace is lovely and sincere in the part, trying to stay true to her husband, to withstand the affections of a Musketeer, and to support her queen. In the end, she even gets to kill someone to protect D'Artagnan. I wish you all could sit with me in the theater to watch and to laugh and to clap. After a few more performances, I might even be singing along to some of these original numbers. This afternoon, the sky grew dark in the middle of the afternoon. I rushed to finish preparing a spaghetti dinner before Earl left for work, so he could dish it into a plastic container to take along. I flipped on the light over the stove, then moved to turn on another light over the counter as the gray clouds rumbled, blocking the sun. Then after he had left, as Spencer and I sat on either side of the wide wooden table, the rain came down with a vengeance and the temperature plummeted. The rain streamed from the downspouts and blew sideways in sheets. Flashes lit up the sky and raindrops pattered against the metal awnings over the windows. I threw up a few windows to smell the aroma of the earth as it soaked in the needed rain. The scent of the air thick with moisture. This afternoon storm reminded me of so many others. When Earl and I lived in St. Petersburg, we would often listen to the rainstorms from his brass bed, the sound on the roof the most romantic of symphonies. When we lived in central Florida, I remember watching lonely storms from the back, screened-in porch and the temptation to run into the fierce rains before they dried up and moved along. After the kids were born, I was more likely to move to the basement as storms rolled in and the overly cautious tornado sirens began their wailing. Now though, with a front porch that looks out over the surrounding houses, I'm drawn there to watch the flashes and listen to the rumblings of the great bowling alley in the sky. How about you? Do you like thunderstorms? You know how a song gets stuck in your head and you can't shake it? Some people say the song is an indicator of your outlook, not merely words replaying over and over. If so, I'm in trouble today. This song was perfect because this is my summer of big ideas and I need to not give up on my big plans. Today though, I can't shake a different song. I've tried to ignore it and then I finally needed to pay attention to it and just laugh. The song is by Bruno Mars and it's called The Lazy Song. Maybe that's a message I need to hear, but don't tell it to my "to do" list. 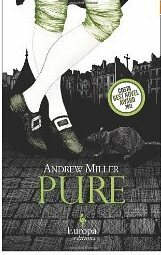 I picked up Pure by Andrew Miller which is part of the Europa editions and won a Costa Best Novel Award in 2011. The book jacket explains that the main character Jean-Baptiste Baratte works as an engineer and must solve the problem of the stench of the cemetery Les Innocents in 1785. A young man, young but not very young, sits in an anteroom somewhere, some wing or other, in the Palace of Versailles. He is waiting. He has been waiting a long time. It's a short intro, which may or may not be good. Someone or something is raking the wood of the door. He holds his breath, listens. The cat with the questionable morals? Had his predecessor let the creature sleep on the end of the bed? Well, he has no objections, would in truth be glad of the company, but the moment he sits up, the scratching ceases. Below his door, the soft movement of a light. Then nothing. At the end of June, I wrote about Earl's niece having an adorable daughter. Little Regan is still a sleepy, floppy newborn which is good since her mother is recovering slowly from her C-section and taking care of her two-year-old Caroline. 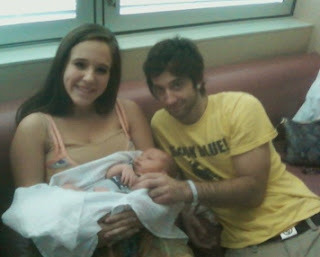 We've gotten to see baby Regan a few times, and now they've asked my husband Earl to be the godfather. He, of course, insists on calling her Ray gun. Now my side of the family has decided to get into the baby business. My nephew Kyle, 24, became a dad last week when Oliver was born. 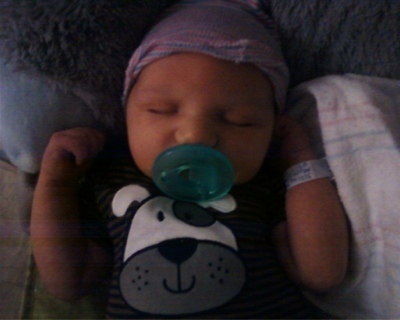 He was big, 8 pounds, 13 ounces. My mom and dad traveled from Florida to Texas this weekend to see the baby, their first great grandchild. 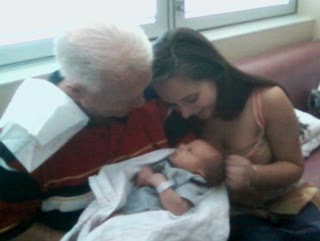 Here's a picture that my mom took on her phone, so it's a little blurry, but this is my Dad holding Oliver, while my niece Abby, 18, looks on. Abby, by the way, is not the mom, but the aunt of Oliver. Abby heads off to college at the end of August. I love how alert Oliver looks, as if he understands whatever secrets my dad is telling him. And here's the new dad, Kyle, next to his sister. Kyle's life has been pretty much go-with-the-flow so far. He plays the guitar in a punk band and has delivered pizzas on his bicycle. All of that should be changing now as he takes on the mantle of dad. I haven't met Kyle's girlfriend, the mother of Oliver, and I don't see myself getting to Texas any time soon, so I don't know when I'll get to see Oliver either. Maybe they'll bring Oliver up north when he gets a little older so he can meet his great, great grandmother, my Nana, who lives in Kentucky -- 5 generations of Kincers. This morning, the Tour de France ended with a sprint along the Champs Elysees. I love watching the racers in the streets, passing the Arc de Trimophe, the Place de la Concorde. I can see the bateaux mouches along the Seine. when bicyclists were not racing. At the beginning of the Tour this year, Swiss researchers discovered something called Higgs Boson, known as the God Particle. Now I don't understand what this is, something about the fact that even empty space has the potential to become something. But what I do know is that at the same time scientists announced they had discovered this Higgs Boson, we were watching Edvald Boasson Hagen ride the Tour de France on Team Sky. And his name seemed so similar, that for the rest of the race, we called him God Particle. Apparently, the rest of the race world didn't pick up on it, cause they said one of his nicknames was Bo-dawg. Today, on the final stretchh up the Champs Elysee, the God Particle led his teammate away from the rest of the field and launched him, allowing his teammate to win the final stage. The God Particle is very selfless. This month, I'm also participating in Paris in July sponsored byThyme for Tea and Bookbath, so, of course, I need a France related photo. So here are some pictures from a 2010 trip to show you why I'm obsessed with France. Beautiful wines with every meal. Cheese shops with rows and rows of choices. A beautiful cathedral or chateau out every window. Simple family meals that are important to the culture. On my way onto campus yesterday, a young mother and her 6-year-old daughter walked past me. The mother had a scarf tied around her hair and knotted in the front as if she covered curlers. She wore sweat pants over her taut body and a t-shirt. She walked quickly in her flipflops, and her little girl, in a one-piece shorts outfit and pony tails, hurried to catch up. The girl carried a bag on her shoulder that slipped down until she pulled it back up. "Now you need to be quiet while you're sitting in the hall," the mother informed the daughter as they scurried past me. The girl silently nodded her head. "That means no singing and no dancing," the woman said. "And no talking loud to Nonni on the telephone. Just draw and write quietly." That made me think differently about this pair. The woman, a 20-something, inner city mother, returning to school. Her daughter home during the long summer days rather than at school. I wanted this little girl to be free to dance and sing. I pictured her, arms outflung, twirling through a grassy field, stopping only to make daisy chains. She only wanted to live, to not be stymied. In spite of the hardships she was born into, she had managed to find joy in life -- joy that made her sing and dance at random moments, like a happy little girl does, like an improbable high school musical. Some people might have judged this mother for taking her daughter along to college and parking her in the hallway. I might have judged her one not-so-long-ago day, but more and more, I see the lives of desperation many young mothers live, trying to claw their way out of poverty. This mother needs to attend college to get ahead. She can't afford to hire a babysitter, and she isn't allowed to bring the girl into class. So she'll leave her in the hallway with a cell phone and a caution to be quiet, to act against her natural little girl instinct. This morning, before I left campus, I stopped by an office. The chair of the English Department is temporarily acting as a dean until the school hires someone else. "I have a big idea," I told her. She stopped what she was doing and turned to listen to me. "We need day care for school-aged children during the summer." I told her the story about the little girl who wanted to sing and dance. "Students should be able to leave kids there free of charge during their scheduled classes." "I'll write it down," she said, searching through stacks of paper until she found what she called her "dean" notebook. "I think it's a liability problem though." Maybe it won't happen. Maybe students will continue to park their children at computers and on couches and in hallways while they sit in the backs of classrooms and worry about their children entertaining themselves. But maybe, our school, heavy with students returning to college, will set up a place that on a sunny summer day, children can sing and dance while their parents study and try to move their family up a step in the economic echelon. The sun above Paris was a mid-July clementine. I bought copies of Le Monde and the Herald Tribune at a kiosk and climbed the stairs to my new office on the Champs-Elysees. For three hours, I mugged at a laptop, trying to figure out how the e-mail system worked. My fingers were chattering. I spent long, spacey minutes trying to find the @ key. They'd given me a keyboard mapped for French speakers, with the letters switched around. Rachel said, with a kind of sadness I hadn't hear in her voice since we'd moved, "I miss knowing what people are saying. Being part of what's going on around me." I think I like this author's voice, even if he does whine about living in Paris. I'm enjoying the Tour de France on television in the mornings. I watch to see the countryside, but also get sucked into the drama of the racing. I cringe and look away at the crashes. Bicycling in France was one of my favorite vacations of all time. 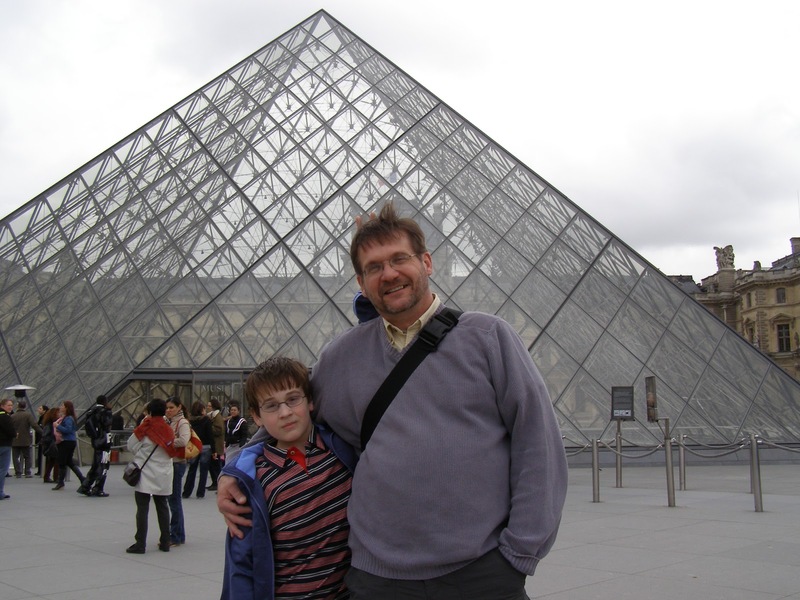 In October 2002, Earl and I left the kids with my parents and went to France for 10 days. We rented bikes from Bourgogne Randonee in Burgundy. They delivered the bikes to Avignon in Provence for us where we began our tour. We traveled with saddlebags on the bikes and nothing else, so we really had to pack lightly. This is me standing with the bikes. In the background on the left is the bridge from the famous song, Sur le Pont d'Avignon, and that's Avignon on the right behind me. We had a very loose schedule planned on where we would stay each night. We pieced together some different bicycle routes from the book Bicycle Tours of France by Gay and Kathlyn Hendricks. The first day was the hardest for me. Maybe because of jet lag, but also because we didn't take any chocolate with us along the way on the 40-mile ride. I think we pictured stopping at a 7/11 type store to buy something to eat. Bad planning. the computer in a more usable form. 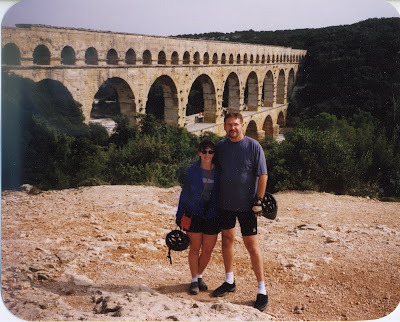 We rode across the Pont du Gard, a Roman adqueduct near Avignon and ended our day in Nimes. We had no hotel reserved, simply pulled into the center of the city on our bikes and went to the tourism office. They helped us find a hotel across the street from the Roman amphitheater. In spite of some rain, we made our way from city to city. One day when it was raining, we put our bikes on the train for a short ride to the next city. We also stayed in Arles, Salon de Provence and ended up in Aix en Provence where the brothers of Bourgogne Randonee retrieved the bicycles. On the trip to Aix, we had lunch in a little village called Equilles. We could see Aix in the distance and we lingered over pork chops and green beans, along with glasses of rose. For some reason, we still consider that simple meal to be one of the best we've ever eaten. Maybe it was the fatigue, the ambience, the company. This trip has been our high standard for vacations since then. We can't wait to move to France someday where we can take bike trips whenever we want. Two hours and 28 minutes total on hold or explaining my problem to a "Customer Service" representative. That has been my experience with Best Buy in the past 13 days. And my $32.01 problem has not been solved yet. I considered myself a loyal Best Buy customer. In the past year alone, I've purchased three laptops from Best Buy. Apparently, I thought the store was reliable because I never had problems with any products. Woe to ye who must sit on hold waiting for a Best Buy "Customer Service" agent. Nevermind the fact that the speakers and the hold music on Best Buy are horrendous. If you ever listened to the hold music on Best Buy, cracking and popping its 1960s tunes, you would never buy any stereo equipment or phones at Best Buy. You'd expect a cutting edge technology store to have at least decent technology. Believe me, I've had 148 minutes of mostly hold music, rarely interrupted by a representative, to listen to. The original problem was complicated. I tried to buy something as a download and I got an error message. It didn't download. So, I tried to buy it again, and again. Each time it seemingly got turned down. Then I looked on my checking account and saw that I had been charged for it four times. I still didn't have the darn product. That was my first call to Best Buy "Customer Service." When I couldn't get a person, I drove to the bank for help. Now, all of the mistaken charges have gone away, except for the original charge of $32.01. Because it was a download and I don't have an actual product to return, they can't seem to wrap their head around me getting a refund. The next day, I went to an actual store -- Target, not Best Buy -- and bought the product I wanted. Now I have the product, but I've paid for it at two places and only have it one. "Take the product back to the store," one of the Best Buy reps told me on the phone today. I never went to the store! I have no product to return. "Well, why'd you leave the store without the product?" she asked. I wanted to bang my head against the wall over and over. I thought I was onto something last week. I got a southern accented man who told me the refund would be processed by Wednesday. It wasn't. Today, I got one hour and six minutes into a call. The woman was helping. She said, "I'll stay on the phone with you while you talk to this department." She walked me through three different departments without success. Then she said she knew the right department and she put me on hold. That's when my call got lost. The loneliness overwhelmed me. She was the only one who understood my problem and she drifted away on the crappy phone system. I went to the end of the cue again as an operator said, "Please tell me the problem so I can direct your call." "No, no, no.... Give me back to the woman who was about to solve my problem," I begged. They couldn't. And the system is set up so she can't call me back or even notify a supervisor that the person she has worked with for an hour got dropped. And that's why I question whether it's actually customer service. Service would indicate that someone got some sort of help, which I haven't gotten. The supervisor I insisted on speaking to today was a little surly. I mean, I wasn't his cheeriest customer, I'm sure. "What's your last name, Mike?" I asked. "I can't tell you that," he said. "What's your supervisor's name, Mike? Even if he or she isn't there, could I have a name?" "I can't tell you that," Mike said again. Maybe the CIA should take some tips from Best Buy because they appear to be good at keep information on the QT. Unhelpful Mike left it by saying he had to send a note to another department. A note? Really? Is he sending it by pneumatic tube? Is he handwriting it and dropping it in interoffice mail? Where's the technology? I would hear from the mystery department when they had resolved the issue, unhelpful Mike said. "So, if it isn't resolved, I won't hear anything?" I asked. "I'll just have to use another 148 cell phone minutes on the phone with Best Buy?" He didn't have an answer. Neither do I, but I know where I won't be turning for help next time. Addendum: About a week after I wrote this blog post, which I sent to Best Buy, I got a call from a Best Buy representative. At the beginning, I wasn't hopeful, as she again reiterated that her records showed I had purchased the software at the store. Trying not to get frustrated, I promised that I had been sitting in my dining room at the time of purchase and that there was nothing I could do other than forward her the email the company sent which showed the day and the price, nothing else. She suggested she could give me a credit to Best Buy. I declined, saying I didn't plan to shop there any more. This customer service rep was apparently allowed to take a little initiative though. She said she couldn't reimburse me for something bought at the store (I didn't scream at her when she said this) but she did credit me the same amount on a computer I bought online the month before. So, after much frustration, I did get my money back. I'm not sure that's true for most people who get caught in the ring of hell known as "customer service." This weekend, my husband and I made the four-hour trip to my grandmother's house south of Lexington, Kentucky. My 94-year-old grandmother hasn't been back in her house since she had a stroke, then nearly died from pnuemonia, then went for rehabilitation in a nursing home and finally moved in with her daughter near Lexington. Last month, she started pushing to go back to her house to live. We agreed to try to find someone who will stay with her and last week my cousins moved her back home. Earl and I spent Friday night with her and she needed care that older people usually need. I trimmed and filed fingernails and toenails. I emptied the portable toilet situated in her bedroom. I took her to the bank and went to the grocery for her. But in the bedroom where we slept, I was reminded of the woman she used to be, the glamourous Nana who ran her own store and worked at the post office. 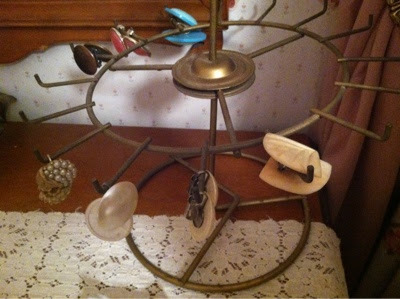 This is a jewelry tree that holds some of her clip-on earrings. I remember as a kid going through Nana's costume jewelry. It felt like 1950s movie star glamour. 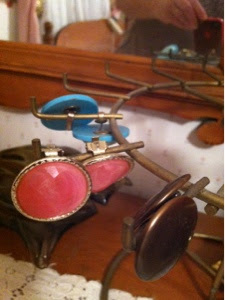 Here's a close-up of some of Nana's clip-on earrings. Imagine her with her tiny-waisted dress, kitten heels, and ginger hair curling around her ears where these big baubles dangled. 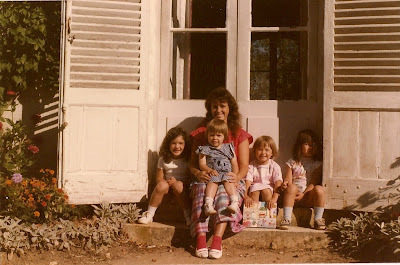 Last Saturday, I posted a photo of the kids with us in France at ages 2, 4 and 6. 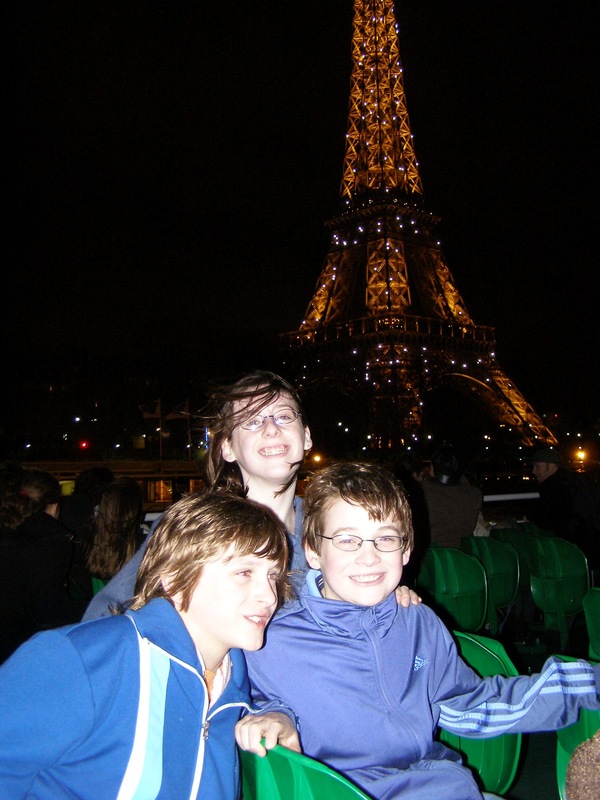 This week, I'll jump forward to the trip we took with them at ages 10, 12 and 14. The challenges were different this time, but still pretty tiring. Again we created some great memories. Here we are in front of the Arc de Triomphe with Grace already towering over me. She chastises me now for letting her traipse through Europe looking awkward and 14. Tucker, age 10, tried to reach up and give his dad bunny ears in every photo. Now, 6 years, later, he could easily give his dad bunny ears. This was, of course, in front of the pyramid at the Louvre. We took a ride on the Bateaux Mouches at night so we snapped a shot of the Eiffel Tower lit up behind the kids. I hope someday, when the kids are all adults we can go together again. Since the emphasis is on Paris in July this month, thanks to the meme from Thyme for Tea and Bookbath , I thought I should introduce you to another French blog that I enjoy. And if you are actually going to Paris, you can buy her book to guide you through the back streets. Linda writes the blog Frenchless in France, although I don't know whether she actually speaks French and is just kidding about being Frenchless. She is from Texas. She married a Frenchman and lives in Paris. She used to have a house in Provence for the summers, but they've sold it now and are building a house in Brittany, I think. Anyway, it's along the sea. Linda takes great photos around Paris and she knows about all kinds of secret places that people should visit. When my daughter Grace, 19, was in Paris, Linda met her in Montmartre for the day and showed her this glorious reflection of stained glass windows. As a matter of fact, I had to edit Linda's hand out of the photo because she was taking pictures too. Grace was traveling alone and was intimidate visiting Montmartre the first time because some overly brazen guys grabbed her arm. The next time she ventured to Montmartre, she met Linda there. 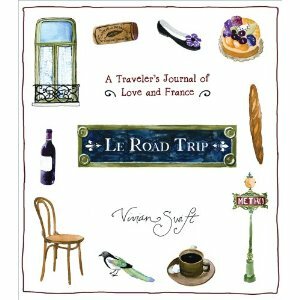 Linda has even written an ebook, a tour to Paris, that anyone could download to their iPhone and take along on their travels. I can't find the link to it right now, but it's called Secrets of a Paris Tour Guide by Linda Mathieu. 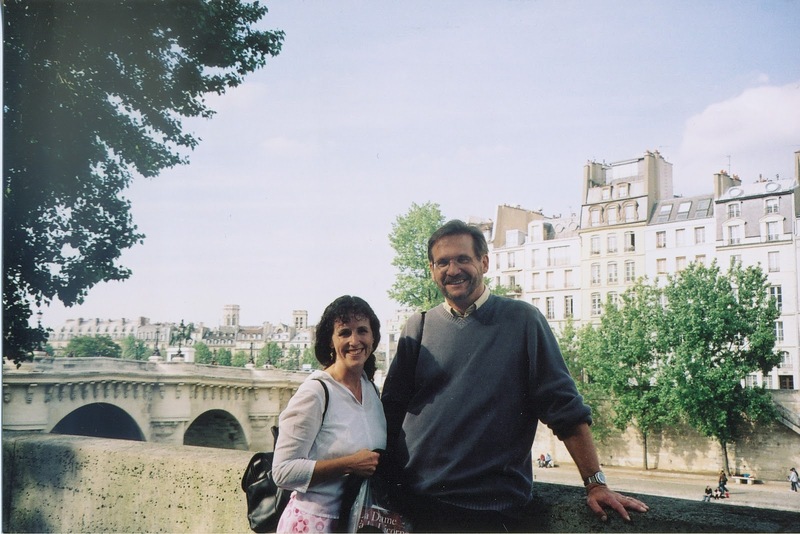 Linda's blog is definitely an American in Paris blog worth visiting. 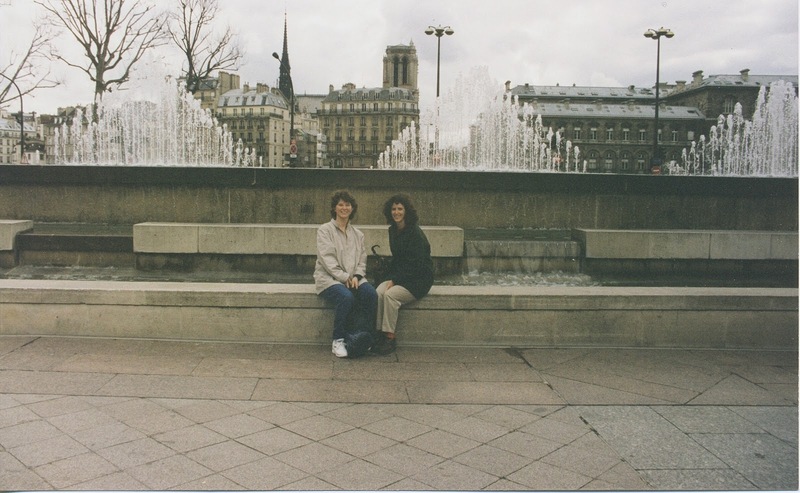 Here's another photo that Grace took while traveling with Linda in Paris. 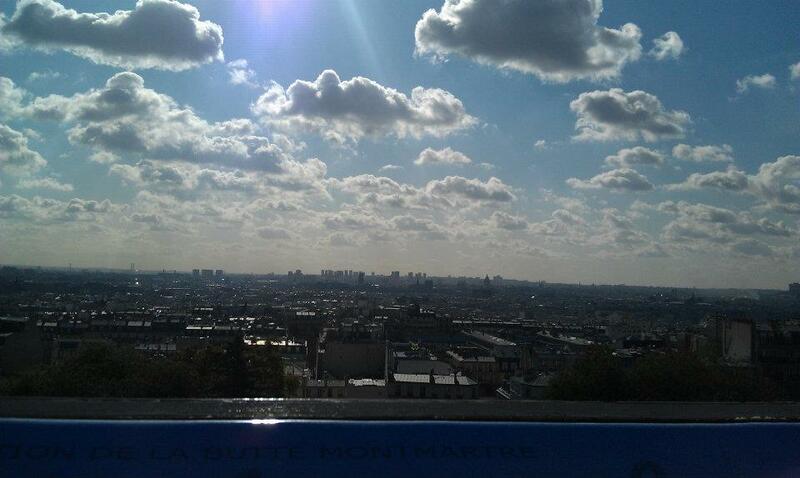 Isn't this a glorious shot from Sacre Coeur? I'm focusing on books set in France and here is a new one I found. 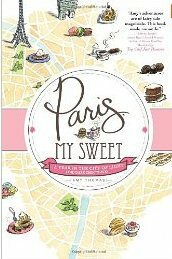 Paris My Sweet by Amy Thomas which was published in February. Here's part of the "Prelude." I guess you could say my story began with a bicycle and some bonbons. 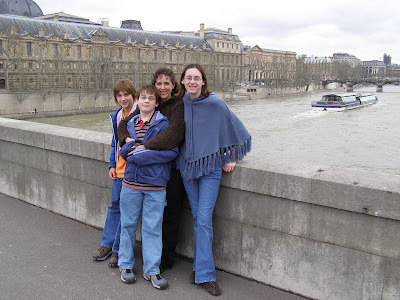 At the time, it just seemed like a fun summer vacation: it was 2008, and I did an apartment swap with someone in Paris. I had already visited earlier that year, but what can I say? 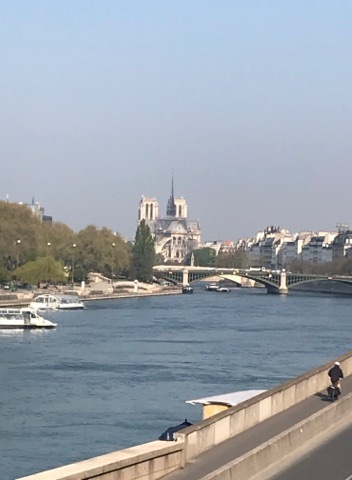 When the invitation to spend time in the City of Light (and Dark Chocolate) comes knocking, my first response is "pourquoi pas?" I've just always been one of those girls. I spent a college semester in Paris, and it was then I fell in love with the city's beauty and grace -- and Nutella street crepes. When I returned to the States, I wore silk scarves and a black beret; the only thing missing from my cliched uniform were the Gauloises cigarettes. "Doesn't it smell amazing?" I gushed once we had crossed the threshold of my favorite boulangerie. Mom, standing inside the doorway clutching her purse, just nodded as she filled her lungs with the warm, yeasty air, her eyes alight with a brightness I didn't remember from home. Just when I'm getting fed up with raising teenagers, Earl's niece comes along with the adorable two-year-old Caroline and now baby Regan. 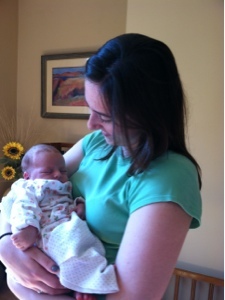 Regan is 11-days old now and I finally got my hands on her. She didn't wake up but half opened one eye as she stretched and went back to sleep. This month, I'm also participating in Paris in July sponsored byThyme for Tea and Bookbath, so, of course, I need a France related photo. I wrote yesterday about the wildfires in Corsica when I visited there more than 25 years ago. I have some great photos from that trip, but they aren't all on the computer yet. 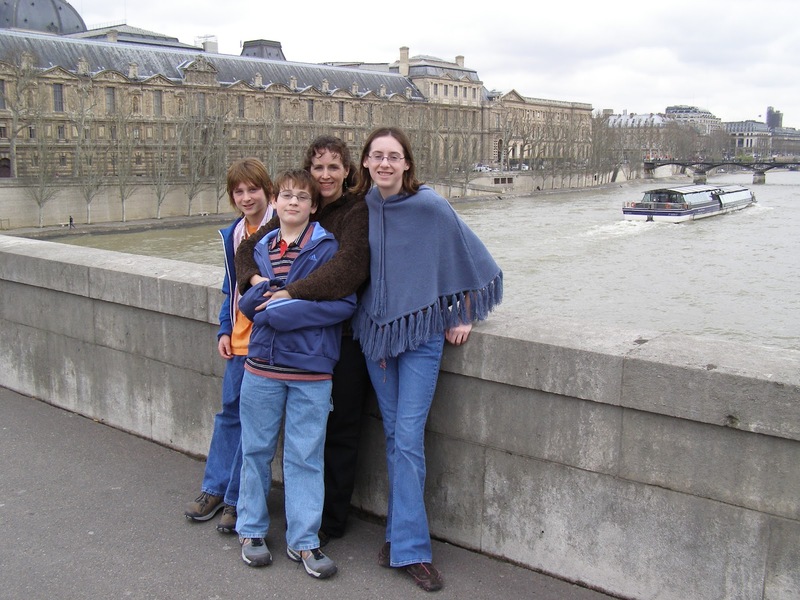 Instead, I'll post a photo from one of our visits to France with the kids. We took the kids to France when they were 2, 4 and 6. Yes, we were slightly optimistic and a little insane, but we have some fun photos and memories of this trip. We've forgotten the exhaustion and frustration. a successful day hunting and gathering for a baguette. 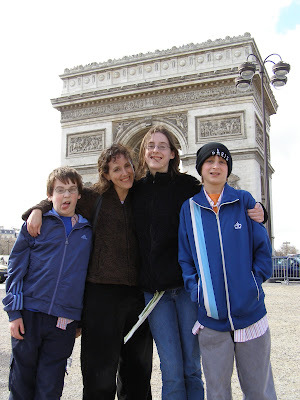 Here's Earl and the kids in front of the Arc de Triomphe. 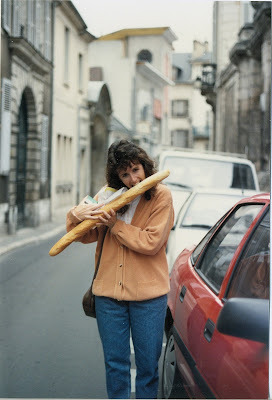 We had just visited a bakery. of the goodness of French pastries at that point.